As I told you in our last post, Alice Waters’ The Art of Simple Food (book number 5) is one of the handful of cookbooks that Kate and I turn to again and again. Subtitled “Notes, Lessons, and Recipes from a Delicious Revolution,”the book distills Alice’s years of experience and philosophy of cooking seasonal, sustainable ingredients simply and respectfully into a series of lessons on organizing one’s kitchen, basic cooking techniques with representative recipes for each, and a battery of basic recipes for every course and season. Whether you are an inexperienced cook who wants to learn, or an experienced cook who wants to hone your skills, this is truly an essential book. We can’t recommend it highly enough. 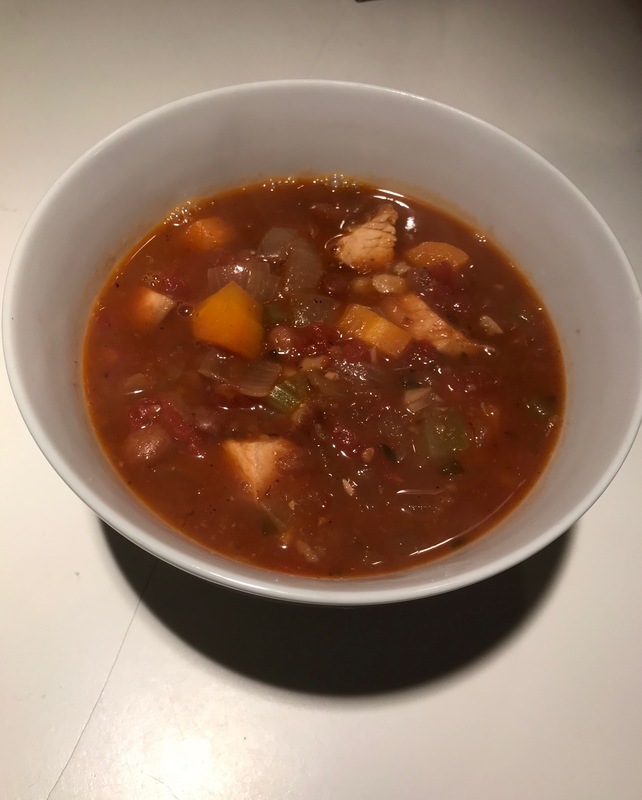 The Art of Simple Food is one of the main books we had in mind when we set our guideline that we couldn’t cook any recipe that we had made before as part of this challenge. Alice’s roast chicken recipe, for instance, is the one that we always rely on, as is her Caesar dressing recipe and her biscotti recipe. So, part of the challenge this time was picking a recipe that we hadn’t already cooked using the seasonal Autumn ingredients we had on hand. Happily, we had a pair of plump free range chicken leg quarters and the rest of the bunch of sage from our Leaf & Caul meat CSA box, onions and incredible fresh garlic from Whatley Farm, and, as always, a supply of our friend Steve Sando’s Rancho Gordo beans. 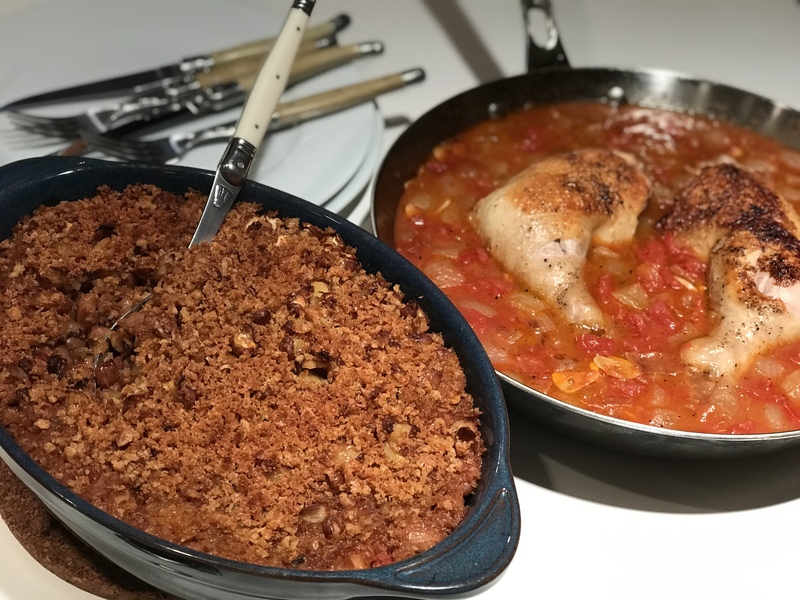 Add a big can of Muir Glen tomatoes, and we had all that we needed to cook two recipes: Chicken Legs Braised with Tomatoes, Onions, and Garlic accompanied by a Cranberry Bean Gratin. Our first tasks were to cook the cranberry beans simply in water and season the chicken legs generously with salt and pepper. 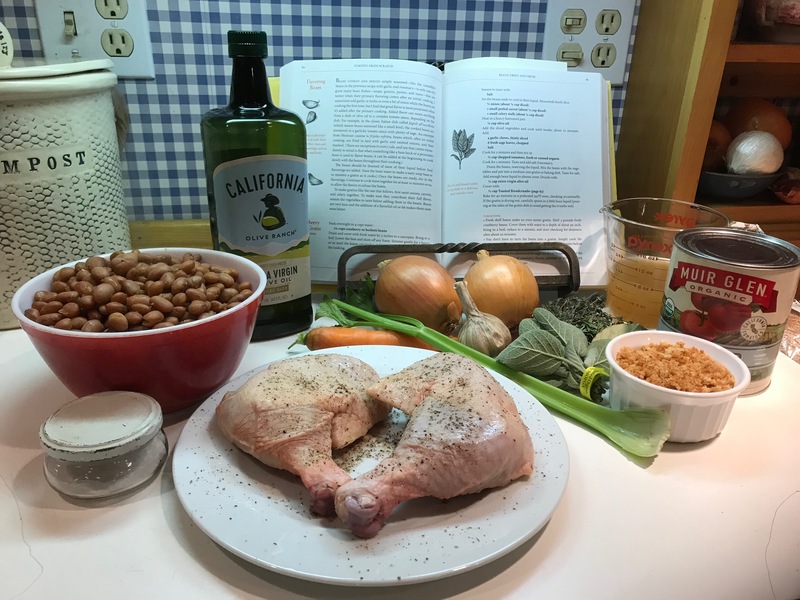 While the cooked beans were cooling and the chicken coming to room temperature, we prepared the vegetables and herbs for both dishes: diced onion, carrot, and celery, sliced garlic, and chopped sage leaves for the bean gratin; chopped onion and sliced garlic for the chicken. For the beans, the mirepoix was cooked in olive oil until tender, followed the garlic and sage, and next diced canned tomatoes. The drained beans were mixed with the sautéed vegetables and poured into a gratin dish with enough of the bean broth to almost cover the beans. Before going in the oven, the beans were drizzled with olive oil and covered with breadcrumbs. Meanwhile, we browned the chicken in olive oil until the skin was brown and crispy. The chicken rested while we prepared the braising liquid: onions cooked in the rendered chicken fat until translucent, then garlic, a bay leaf and a sprig of rosemary, and, again, canned diced tomatoes. The chicken was nestled among the vegetables moistened with a cup of chicken broth. After bringing the broth to a boil and then back down to a simmer, we covered the chicken and put both the chicken and the beans into the oven. Both dishes were supposed to cook for about 45 minutes but at slightly different temperatures, so we took advantage of having two ovens. If we’d only had one, we could have braised the chicken on the stove top, but I prefer taking advantage of the steady heat of the oven over our ancient electric range whenever we can. Both recipes came out great. We served the chicken on a bed of the vegetables from the braise alongside a generous scoop of the bean gratin. 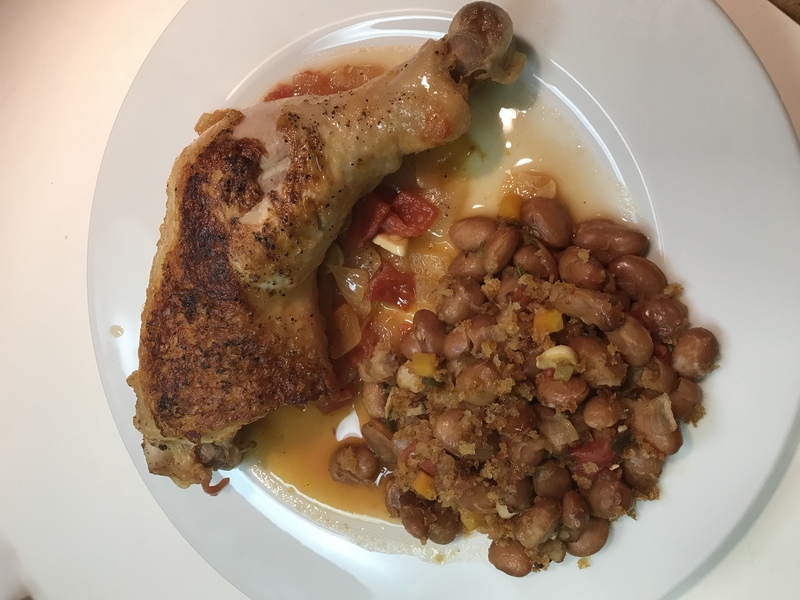 The chicken was moist, succulent, and toothsome, as only a heritage breed free range bird can be, and the beans were crusty on top and fragrant with the aromatic herbs and vegetables. The leftover bean gratin played a supporting role again the next night at Kate’s birthday dinner along with a green salad and amazing Jersey ribeyes from Otter Farm, and the balance of the beans made a great clean-out-the-fridge soup combined with the reserved bean broth, the braising liquid from the chicken, and some cubed leftover piri piri turkey breast a few nights later. I love being creative with leftovers, and often times, the new dishes are just as good as the original ones. Up next: Chez Panisse Vegetables.